Program the controller directly or via the free app on your smartphone/tablet - no more looking for tap points in garden beds! Currently on special for $89.95, click here for more info! 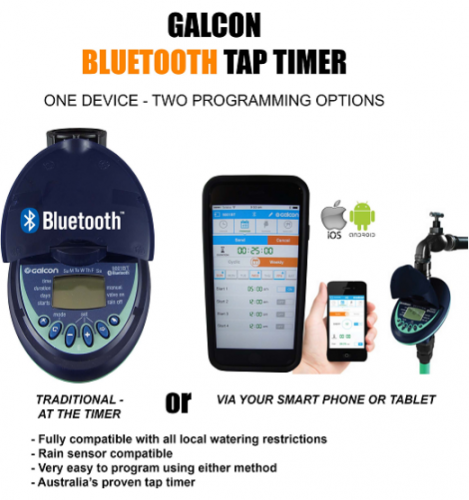 The Galcon 9001BT BLUETOOTH Hose-End 9V Battery Operated Irrigation Controller is compatible with Bluetooth 4.0 devices (min. iOS7 or Android V4.3) and can be programmed and operated manually or by Smart devices. The controller communicates with your Smart device within a range of 15 to 90 feet. One App can manage several controllers and has the ability to name each controller, capture an image of the irrigation zone, or upload images from your Gallery. Outdoor weather resistant, easy to install, simple to operate. Download and install the free GalconBT App from either Google Play or App Store, or scan the bar code on the controller package.